From our perspective, Sandusky would not have been able to do what he did had he not had access to so many boys growing up in father-absent homes. Sandusky intentionally surrounded himself with children from homes that didn’t have involved fathers by starting a foundation, The Second Mile, dedicated to helping boys from “disadvantaged” homes. Of Sandusky's known victims, six had no father in their lives and three admitted to never having known their dads. On the witness stand, many of the boys said they thought of Sandusky as the father they'd never had. 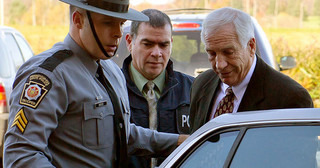 One boy said, he (Sandusky) "treated me like a son in front of other people.” Another victim testified, "I looked at Jerry as kind of a father figure...I didn't want to lose somebody actually paying attention to me." NFI understands children have an innate need for their fathers’ affirmation and attention. “Children have a hole in their soul the shape of their fathers,” says NFI President Roland Warren. And we know from decades of research that fathers matter. Whether a father is in the home and involved or not changes just about everything – for good or ill. Sadly, folks like Sandusky know this and prey on children with absent fathers. Like drug dealers or gang leaders, they exploit what they recognize as a weakness or vulnerability in a child craving adult male attention. We also know through social science research that children from father-absent homes are far more likely to suffer physical and sexual abuse than those growing up in two-parent families. Economics will not fix this problem. Needy children exist in wealthy homes, too. Only a society willing to educate and train up a generation on the importance of fatherhood can change this problem. In other words, we need to get to the root by asking the most-pointed question more often: “Why were these kid’s victimized?” More often than not, the answer is going to be because their fathers weren’t there to protect them physically and emotionally.